Deputy Foreign Minister Sergei Ryabkov said the missiles were a "stabilising factor" that could dissuade "some hotheads" from entering the conflict. The decision came as the BBC heard evidence that 200 people were killed in a massacre in western Syria this month. More than 80,000 people have been killed and 1.5 million have fled Syria since the uprising against Syrian President Bashar al-Assad began in 2011, according to UN estimates. While lifting the EU arms embargo is theoretically good news for the fractious Syrian opposition, it is clearly going to be some time before it has any effect on the battlefield balance. Its authors hope the decision will send a strong enough signal to the Assad regime that it is time to hand over power. That is extremely unlikely. It is hard facts on the ground that count for a regime that has shown determination to fight to the end to stay in power. While European arms supplies remain for the moment theoretical, the step has stirred an angry reaction - possibly even an escalation - from the Russians. They've said the move jeopardises efforts to convene a peace conference, and that they plan to honour a prior contract to supply Syria with advanced S-300 air defence missiles. Israel sees that as a threat to its own security, and has warned that it "would know what to do". The stakes are clearly getting higher. But for the rebels, at least the eventual possibility of carefully-controlled arms deliveries is there, in what looks like being a bloody, long-haul struggle. On Monday, the EU said member states would be able to decide their own policy on sending arms to Syria, after foreign ministers were unable to reach the unanimous decision required to extend the current arms embargo past Saturday. However, in a declaration announced after 12 hours of talks, it agreed not to "proceed at this stage with the delivery" of equipment. Speaking to the BBC, UK Foreign Secretary William Hague said the 1 August date did not represent a deadline, and that the UK could start arming Syrian rebels from now, although it had no active plans to do so. A US state department spokesman said the US supported the EU's move. The Syrian foreign ministry said the decision showed the EU's "obstruction of international efforts to contribute to the achievement of a political settlement". Russia says the move directly harms the prospects of an international peace conference proposed by Moscow and Washington that would be held next month. "A whole range of actions that have been undertaken, not without the participation and not without the support of our Western partners including the United States and France... are serving to undermine the idea of calling a conference," Russian media quoted Foreign Minister Sergei Lavrov as saying on Tuesday. Russia has repeatedly blocked efforts to put more pressure on Mr Assad. Along with the US, Moscow has been leading efforts to organise an international peace conference on Syria next month. 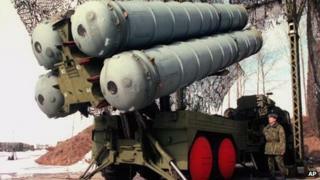 Mr Ryabkov said the contract for the S-300 missile systems had been signed several years ago. "We consider these supplies a stabilising factor and believe such steps will deter some hotheads from considering scenarios that would turn the conflict international with the involvement of outside forces," he was quoted as telling journalists, in a coded reference to the use of Nato warplanes in Libya. It is broadly comparable to the US Patriot system which has been deployed by Nato to guard Turkish air space against attack from Syria. There had previously been a reluctance to mention the sophisticated weapons system by name, and the BBC's Jim Muir in Beirut says the latest Russian statements could be seen as an escalation. Indeed, some analysts see confirmation of the arms sale as a "game changer" for the Syrian crisis. Le Figaro, France: The 27 reached a lame compromise under the threat of the imminent collapse of the sanctions imposed on the regime in Damascus two years ago... The disunion also testifies to the paralysis which Europe's rule of unanimity imposes, at the worst point of the Syrian crisis. WirtschaftsBlatt, Austria: The domestically damaged governments of Britain and France are playing with fire. The British-French initiative risks repeating in Syria the mistakes of Afghanistan's Cold War. Cameron and Hollande should not promote chaos in the Middle East by possibly arming terrorists, in order to polish their image at home. Therefore: Geneva convention instead of weapons for an intangible war party. El Mundo, Spain: The inability to reach a unanimous agreement on this crucial issue of foreign policy has prompted some legal ingenuity: the partial lifting of the arms embargo was signed in an intergovernmental agreement, ie outside EU community legislation. This is an important caveat, because it leaves it up to each member state to take the final decision on whether or not to arm the Syrian opposition. "It virtually ensures that the US-Russian talks will be meaningless, sends warning signals about similar arms transfer to Iran, can drag Israel into the Syrian fighting, and would sharply alter US and allied 'no fly' capabilities," said Anthony Cordesman of the Centre for Strategic and International Studies. There had been reports that Moscow was holding back on delivering the arms, in exchange for an Israeli commitment not to carry out further air raids over Syria, our correspondent says. Israeli Defence Minister Moshe Yaalon said the Russian missile systems had not yet left Russia. "I hope they will not leave, and if, God forbid, they reach Syria, we will know what to do," he said. Other EU states had opposed sending arms. George Jabboure Netto, a spokesman for the opposition Syrian National Council said the dropping of the arms embargo was a "step in the right direction", though a spokesman for another grouping, the Syrian National Coalition, said the move might be "too little too late". The Syrian opposition has not said whether it will attend next month's peace conference, and was on Tuesday locked in talks in Istanbul, Turkey, as an unofficial deadline to decide on its attendance passed.